Late yesterday, Vive pre-order customers in Europe began receiving cancellation emails regarding their order. We’re not sure if there are any common denominators here, but there could be a discrepancy with Visa cards and Digital Rivers (they handle payment processing for HTC) or banks are taking legit precautions and HTC is taking too long to re-attempt to process the transaction. Whatever the case there are a lot of sad campers in Europe and HTC phone reps have their hands full this weekend. 1st UPDATE: Here’s a little update we just read regarding cancellations in the US (not sure US they apply globally yet). The email that is being sent may be an automated false positive with the scary word “cancelled” in it. HTC is trying to clarify the situation and is expected to send an email this afternoon with the latest details about the mix up. An e-commerce rep told the person in the link above that orders have NOT been cancelled and no one has lost their place in line. We’ll keep you posted. 2nd UPDATE: HTC has posted an update on their blog trying to minimize the chaos. They say this is happening to a small amount of customers and they have already reinstated several of those orders. If you received a cancellation notice your should definitely call HTC to get their attention on your order. More on the HTC blog. 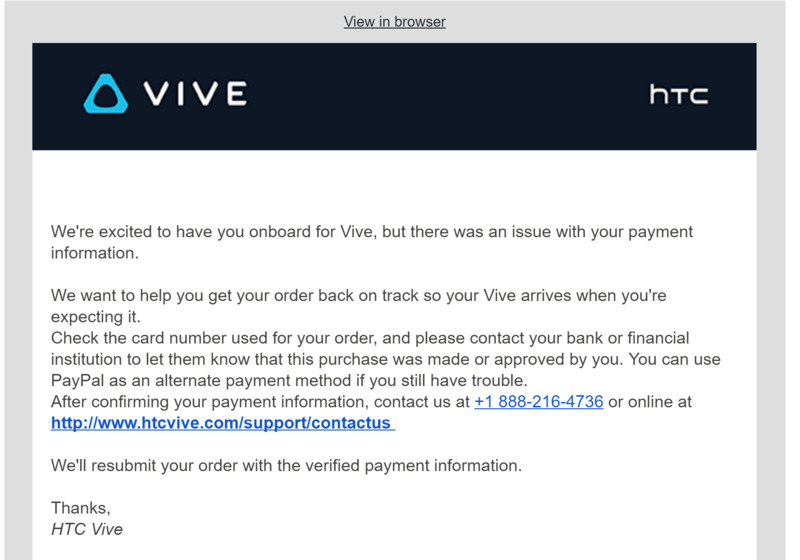 We’re excited to have you onboard with Vive, but there was an issue with your payment information. In the email, HTC gives you a number to call them back and recommends you contact your back to let them know HTC tried to process a transaction and will try again in the next 48 hours or to use PayPal as an alternate method of payment. In some of the info we’re reading, customers have been told HTC may wait longer than 48 hours to re-try the transaction to avoid another hiccup. This led to HTC sending out a tweet on March 31st asking pre-order customers to notify their banks of the upcoming purchase. Reminder: Let your bank know the Vive charge is coming. For bank issues, your order is not automatically cancelled and will be re-attempted. For some of those who received the warning notice, their 48 hours has passed and their order has apparently been cancelled by HTC. If you are one of these unlucky customer, get on the phone with HTC and if you have to re-order the Vive be sure to request that your package is shipping in April. It doesn’t get your place back in line (if that even matters with HTC’s processing), but it will at least help get your Vive here the month you were expecting it. In the US, the first wave of transactions started on 29 MAR, these people have then received shipping info on 1 APR with an estimated arrival date of 5 or 6 APR. So far it appears these notifications are being sent to residents on the West coast, mostly in Arizona, but we’ve seen a few comments from California and Washington. It could be because they’re in the 3rd and 4th regions from the shipping location if this is accurate info. With the info we’re seeing on reddit, it doesn’t seem to matter how early you pre-ordered the Vive. Some that ordered within the first ten minutes are getting tracking details and some who ordered outside that initial blast are also getting dates. We checked with our bank institution and the transaction says it is pending. While we hope this is a good sign, it would be a bummer if the same thing happens to all these poor folks in Europe who knew nothing better than they ordered their Vive fair and square. We hope HTC is able to sort this out, but the fact that this is happening on a Saturday is not very promising to a quick solution.